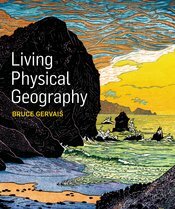 Bruce Gervais’ new text offers a fresh approach to the study of physical geography, combining print and digital media to create a scientifically substantive work that is written for students. Living Physical Geography focuses on human-physical geography interactions, using pedagogical features in the textbook and online to create a modern synthesis of the science of physical geography. Each of the four major parts in Living Physical Geography is identified by energy flows within Earth’s physical systems. Additionally, landscape analysis underpins the body of the text. Step-by-step examples are used to illustrate how landforms and systems develop, evolve, and change through time. Living Physical Geography is accompanied by its own dedicated version of W.H. Freeman’s breakthrough online course space, LaunchPad. LaunchPad offers acclaimed media content, curated and organized for easy assignability and presented in an intuitive interface that combines power and simplicity.